So what is Orange Julius? The drink originates from an orange juice stand in Los Angeles in 1926. As a company, it’s had its ups and downs, but today it is successfully selling drinks in stores, malls and – after the chain was bought by Dairy Queen in 1987 – as a trademark drink across much of the globe (but not across Europe – however, watch this space, we’re officially in Dairy Queen’s sights). The drink itself is orange juice blended with something sweet, something a little sour, something creamy, something frothy and a little fizzy and something that’s probably vanilla. Dairy Queen cite a ‘secret ingredient’ for its distinctive taste. And indeed, whenever we drank an Orange Julius as kids, it would not be long before somebody would say, ‘I wonder how they make it?’ Well, legally, Dairy Queen have to list the ingredients so we can find out ourselves, but it’s full of the usual baffling chemicals, including Orange Julius ‘flavour enhancer’ – perhaps that’s the secret ingredient? I believe I have identified the secret ingredient: dip-dab, or less specifically, sherbet. The taste is like orange sherbet, especially the push-up tubes of orange sherbet ice cream, or orange-flavoured sherbet powder. I’ve been to the sweet shop hoping to collect in a little paper bag, flying sauces, dip-dabs, sherbet fountains, sherbet straws – the sweets of yesteryear and nostalgia… and happily I did find a dip-dab. A quick test in some orange juice and I am immediately taken toward the flavour of a Julius. At the heart of an Orange Julius is the counter-intuitive blending of orange juice and milk. But in fact, there are historical examples of drinks made with acidic wine, ale or beer and mixed with milk, drinks which eventually became the basis of our set syllabub and posset puddings. Orange juice, milk and cream are the main ingredients in an orange ‘cream’ sherbet in my Fannie Farmer cookbook (probably the same recipe as the orange sherbet ice cream in a tube mentioned above). The recipe is a corruption of a normal fruit sherbet, which is called a sorbet in the UK. The appealing clash between all fruits and cream is essentially a mild reaction between an acid and a base. With an Orange Julius, the orange juice is full of citric acid, and the milk is a base. The milk neutralises the acid and the two together create a pleasing tang, the same tingling tang you get when eating sherbet powder – the sherbet contains a mix of acid and alkali powders, the reaction occurs when the powder hits a moist tongue. Historically this powder was also mixed in water to make a flavoured fizzy drink. Clearly mixing milk and orange together create a sherbet-like taste, but I am going to do my own ‘flavour enhancing’ and put actual sherbet in my Orange Julius. Okay, milk and juice do go – but eggs too? We know from Dairy Queen’s ingredient list that there are egg whites in an Orange Julius. Historically, nogs were drunk on the same principle of mixing milk or cream with acidic alcohol as well as eggs – rather like the egg nog of modern times. 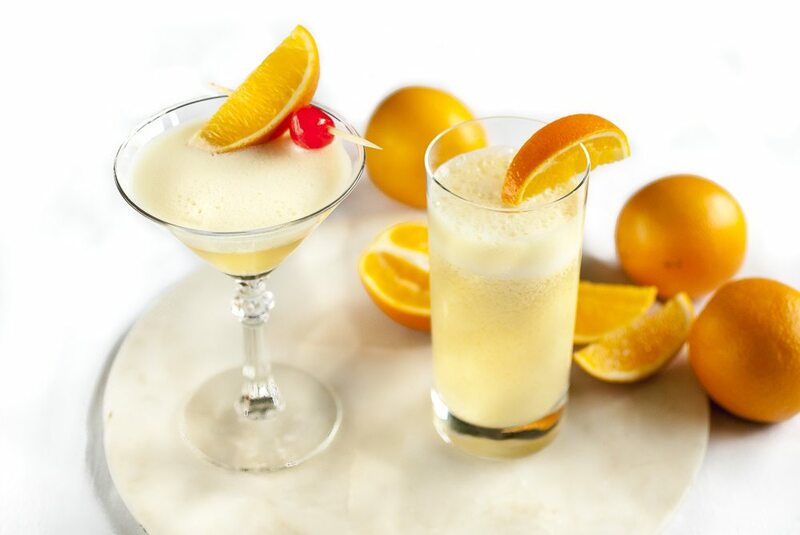 The result is similar to a rich and creamy Orange Julius. So the final ingredient in the recipe is eggs – I whizzed up an egg white with orange juice and was surprised by the soft lusciousness of the foam. It made the drink smooth and silky with a good deal of effervescence and an attractive head of froth. However, it also tasted of egg, the same taste I get when I substitute powdered egg whites. Then I had a brainwave. I tried a meringue nest. The egg white is safely cooked with sugar – and miraculously, has the same effervescent and soothing effect on the orange juice as raw egg white – happily it also tastes more like meringue than egg. Based on my unreliable memories, I reckon I’ve cracked the secret of Orange Julius. It tastes how I remember an Orange Julius, but more than that it reminds me of how I felt as a teenager in California – a time, when we were full of youthful energy, when the sun was out, the surf was up and life was good. Read my story above to see the explanations for the meringue and sherbet. The milk needs to be full-fat whole milk to help give the smooth creaminess. If you cannot get hold of sherbet try using buttermilk or a mix of milk and yogurt, or perhaps add a few drops of lemon. Although, the aim is to make the drink less acid, the tang comes from mixing sweet and sour – in this recipe, the natural tang of milk and orange is enhanced by the the sherbet. Keep all the ingredients well chilled. If possible, freeze the orange juice. It will not freeze rock-solid and will easily blend. Avoid using ice cubes for the long drink – it dilutes the orange flavour. Whizz all the ingredients in a blender at maximum speed, keep it going for a few minutes until very smooth. First make the above Julius recipe using half the amounts shown per cocktail. Blend, then pour the Julius in a shaker with ice and the alcohol of your choice. Shake, strain and decorate glass. Try experimenting by adding Cointreau, or Grand Marnier (you could hold back on the sherbet to give the drink a more adult tilt).